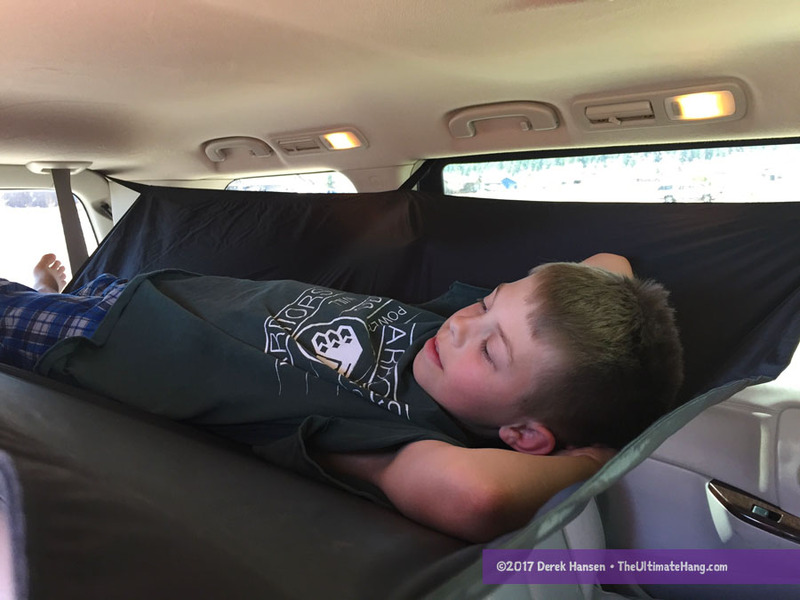 The USA-made Car Hammock by Ely Innovations, LLC, is a rectangular hammock designed to go inside your vehicle. The hammock wraps around the car and attaches much like many bike racks, using rubber-coated hooks that clip to the hood and trunk. The style is open with a sort of hybrid bridge and platform design. The Car Hammock fits most 4-door sedans, wagons, and small- to mid-sized SUVs, but check with the company first to ensure your vehicle works. I was able to get the hammock I was sent in my Nissan Quest and Chevrolet Traverse, but it worked better in the Quest. Set up is pretty easy and straightforward, but it can be a little tricky the first time. Once you get the suspension adjusted for your vehicle, it is much easier to set up. First, you need to lay down the seats. Next, put the hammock inside and spread it out. Take the suspension and run it out through each open door. For the front windshield, the buckle strap “hugs” the windshield and buckles in the center. The center strap “hugs” the roof of the car. The rear strap goes through the back doors and “hugs” the rear windshield. Clips on the front and rear of the hammock attach the hood and trunk respectfully. There is a center adjustment strap that helps to support the middle of the hammock and prevents it from sagging in the middle. One of the first challenges with the design is, of course, head room. It also follows that getting into the hammock is a bit of a chore, as you have to wriggle up to get into position. For those folks fearful of tight spaces, I do not recommend using the Car Hammock. Still, once you lay down, you’re set. This hammock opens up all sorts of possibilities for dirt baggers, road trippers, festival junkies, and ski bums looking to live out of their car. The advantage there is that you can extend your car’s living space and use the built-in rain protection, speaker system, and critter control. On the downside, the hammock is small. Measuring only 64 inches (163 cm) long, I wasn’t able to fit my whole body across the fabric. Because of the platform/bridge design, laying diagonally to get more fabric under me isn’t really possible. The scooping fabric keeps your body mostly in the center of the fabric. In my Traverse, the foot end of the hammock wasn’t able to get taut, so it sagged more, which meant I wasn’t really ably to lay flat at all. Having my feet hang off the end isn’t the end of the world, however, and with a sleeping pad under me, I could sleep. Laying on my side or in the fetal position is more comfortable for sleeping longer term. Still, I wish there the hammock was a little longer. Suspension and Anchor System ♥ ♥ ♥ ♥ ♥ The straps, clips, and buckles are all provided and work well. Modularity ♥ ♥ ♥ ♥ ♥ As expected, not a lot of options to use this hammock other than how it is intended. Aesthetics ♥ ♥ ♥ ♥ ♥ Available in black. Price and Value ♥ ♥ ♥ ♥ ♥ For a USA-made hammock with the components, it is priced well. Beware of use in the rain. I made a similar DIY hammock for a minivan and found the straps channel water inside. This allows water to both drip inside the vehicle and get the edges of the hammock wet. Not a deal breaker, but something to be aware of. Good points, thanks! And you had the doors closed? Rain leaching in along straps will always be an issue. I have used soft racks for surfboards for 30 years, they still haven’t solved that problem! Good comments on the rain “leaching in” on the nylon straps. I wonder a couple of things? Are they more prone to water leakage because they are compressing the door seals and secondly, if they truly are leaching water in, if you could simply spray them with a water repellent or sealer to minimize the wicking effect? I don’t know if the compression helps or hinders the water, but having a drip line could help.